Because I have nothing to say about Alexander Wang's S/S 10 line (and I'm not the only one - armageddon cometh? 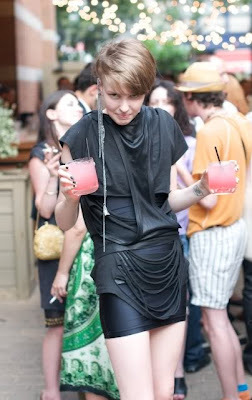 ), check out the Trashicist's fierce wardrobe for the Rad Hourani (I don't mind talking about him) diffusion line party/show. I DIE! I die and steal her soul. I truly am the only blogger miles and miles away from a catwalk right now. I'm also leaving a week before L.A. Fashion Week. Nice, right? Nothing doing today except copious tweeting in front of the tv. UPDATE: sorry babes, so this is from a show back in July. No biggie. Either way, I really don't have anything to say about Fahion Week right now anyway. The Trashicist always kills it - mainly it's that fantastic earring that does it. Spectacular piece of jewellery! Also a huge fan of the trashforcereaper-blog, maybe even more now. Finally someone comes out and says what we all are thinking - that blogfave Wang (and Wasson, god) isn't that interesting at all. Very disapoointing collection in my opinion. AT LAST! A new comment around these parts, and from someone I've never seen before too! thank u thank u verre much, my dear. deeply appreciated. Honestly, I do like Wasson and Wang but Wang won't get me to jump off the cliff this time! Haha, I've been coming back here for a few days (that fantastic stair-bookcase really caught me, I knew I could expect good stuff if there's anything else posted than alexa chung), the appreciation is entirely on my side. I like Wasson every time I see her apartment over at the Selby (so fantastic... sigh), but other than that, I can't help but feeling she's overblogged. As is Wang. But maybe that's just my fault for reading generic blogs? Anyways, I'm glad there's some discussion over the collections. The public won't settle for just anything, I hope that atleast.